MENLO PARK, CA—In an effort to ensure constant engagement with the social media site, Facebook announced Monday that users would now receive notifications anytime they are not currently looking at Facebook. “We hope these helpful new alerts will improve our users’ experience by prompting them to revisit the site in the event they momentarily turn their focus elsewhere,” said Facebook CEO Mark Zuckerberg, adding that the site’s new technology is able to track where users’ attention is directed and remind them with steady beeping sounds that they are not currently interacting with Facebook. 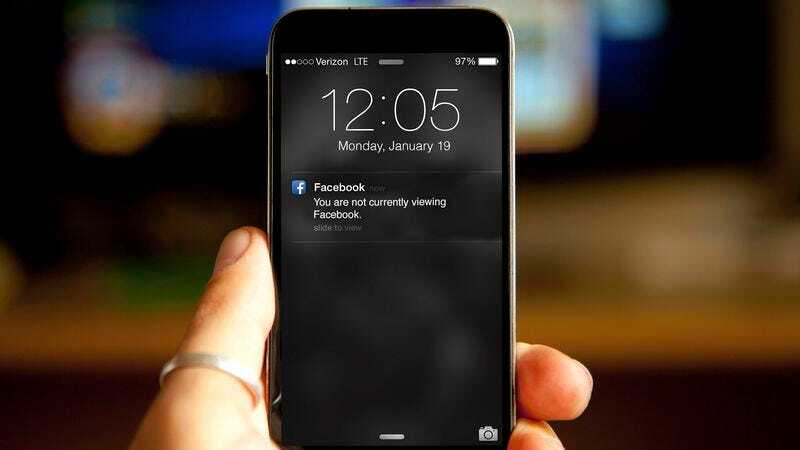 “The notifications will be integrated into both web and mobile browsing, and all users not currently on Facebook—or logged in but looking at a different tab—will immediately begin receiving push notifications, pop-ups, and emails warning them that they’re not on Facebook right now and should resume interfacing with it.” Zuckerberg went on to say that notifications informing users when they are currently looking at Facebook will be introduced by the end of the year.